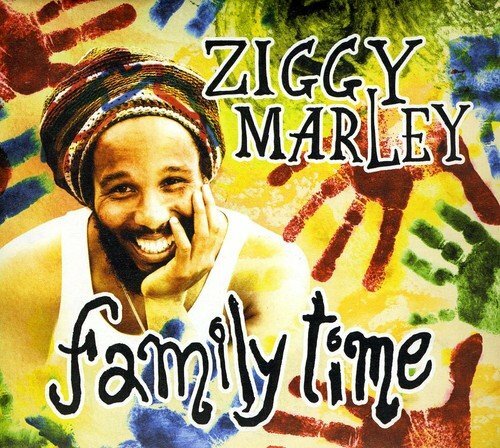 In the wake of his 2006 album Love Is My Religion, which earned his fourth Grammy Award, Ziggy Marley shares his musical love with families - his own and the extended human family. Marley's third solo release, Family Time, is produced with old friend Don Was and will be released this May on Marley's independent Tuff Gong Worldwide label. An easygoing journey of original tunes and a few covers, the album offers a full collection of family-oriented songs for those already familiar with Marley's beloved work in the genre, and may serve to introduce today's youngest generation to reggae. Highly listenable many times around, a quality that parents will appreciate, Family Time resonates with themes of love, responsibility, unity, freedom and fun (not to mention generosity - proceeds from the sale of Family Time will benefit Chepstowe Basic School in Port Antonio, Jamaica). "I know how important music can be in a child's growth and development, and in a parent's connection with their children," explains Marley, whose own brood recently grew to five. "This record represents my daily family life and is inspired by my three-year-old daughter Judah and baby Gideon. It was a joy to make and opened up new avenues in my creativity." For the album's recording sessions, Marley invited like-minded collaborators ("friends" rather than "guests") to join him in crafting its familial sound. Kids will love the gentle grooves; grownups are sure to be impressed by the musicians making them. Collaborators include current Who bassist Pino Palladino, Grammy-winning keyboardist James Poyser (Erykah Badu, Common, Al Green), percussionist Rock Deadrick (Ben Harper, Tracy Chapman), longtime touring guitarist Takeshi Akimoto, and legendary reggae drummer Santa Davis. It was a serendipitous phone call about Davis that brought Paul Simon to the project, lending his instantly recognizable voice to the sweet advice of "Even If You Fall, Get Up." The Woody Guthrie standard "This Train" offers a warm-hearted duet with Willie Nelson, who brought along his ace harmonica player/sidekick Mickey Raphael to accompany him. The notion of kids as superheroes defending the Earth echoes through "Future Man, Future Lady," with Marley joined by Noggin network star Laurie Berkner. Another children's performer, Elizabeth Mitchell, gives an angelic lift to "Wings of an Eagle," based on the classic "Wings of a Dove," while Hawaiian singers Jack Johnson and Paula Fuga help sympathize with the young ones on "Cry Cry Cry," a child's call for freedom. Ziggy Marley plays covert travel agent on "Take Me to Jamaica," imagining a journey through his homeland along with Jamaican '60s icon Toots Hibbert. Actress/author Jamie Lee Curtis also contributes to the album, narrating two short stories, one of her own and one penned by Ziggy ("Helping Hands"). Of course, Family Time derives much of its authenticity from the voices of children, including Marley's. On the title track, three-year-old Judah helps her father implore listeners, young and old, to "lift up your hearts with a smile...it's time to be free." And on the tuba-bouncing tune "I Love You, Too," the importance of that simple phrase finds meaning in the family circle of Ziggy, mother Rita and sister Cedella. The album also includes the traditional Caribbean song "Hold 'Em Joe" (the first song that Ziggy sang in front of people as a child), "Ziggy Says" (a version of "Simon Says" which kicks into double-beat midway) and "ABCs" (with gentle leg-slapping and funny mouth sounds accompanying "A is for Africa, B is for Brother..."). Generations of listeners have long embraced Ziggy Marley's work for children, beginning with Marley and the Melody Makers' rendition of "Give A Little Love," the percolating, sing-along track on the 1991 Disney compilation For Our Children, an all-star benefit disc that arguably launched a revival of high-quality, kids-oriented music. Marley has also contributed to several acclaimed children's programs: the theme-song voice for the popular PBS series "Arthur" and a tune for the Dora The Explorer's World Adventure CD. Most memorable may be his voice in the role of Bernie, the Rasta jellyfish, in the animated Shark Tale, where he also sang his father Bob Marley's "Three Little Birds" with his brother Stephen and dance hall star Sean Paul. Marley has been repeatedly drawn to family-friendly projects as a musician, humanitarian and even an actor. He is an active supporter of Little Kids Rock, which brings musical instruments and music lessons to children in public schools, and he founded U.R.G.E. (Unlimited Resources Giving Enlightenment), a non-profit organization that benefits a wide range of charitable children's causes in Jamaica and other developing nations. Marley hopes to share the messages of Family Time with children and families the world over. He's already thinking about how to present this work live, the visuals as well as music. "I want this to be a complete thing," Marley says. Expect concerts, perhaps children's books, more recordings and even an animated series coming to fruition. His ambitious, multimedia approach reflects the multilayered ideas of Family Time. "Usually my songs mean more than one thing. Family Time is my family, your family, the world's family."